On April 26th, 1871, a police constable walking one of London's remotest beats stumbled upon a brutalized young woman kneeling in the muddy road, her face smashed and battered. The policeman gaped in horror as the woman stretched out her hand to him, collapsed in the mud, muttered "let me die," and slipped into a coma. Five days later, she died, her identity still unknown. Within hours of her discovery, scores of Metropolitan Police officers were involved in the investigation, while Scotland Yard sent one of its top detectives to lead it. On the day of her death, the police discovered the girl's identity: Jane Maria Clouson, a sixteen-year-old servant to the Pooks, a respectable Greenwich family. Hours later, they arrested her master's son, twenty-year-old Edmund, for her murder. 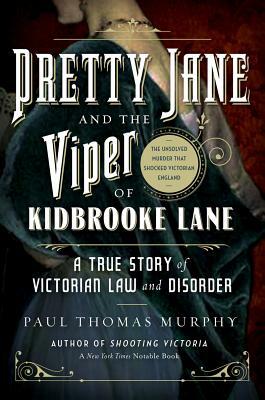 An epic tale of law and disorder, Pretty Jane and the Viper of Kidbrooke Lane is the story of a criminal case conducted at the time of the birth of modern forensic science. It is the story of the majesty-and the travesty-of the nineteenth-century British legal system: the zealous prosecutors determined to convict young Pook; and the remarkable lawyer equally determined to obtain his acquittal by any means possible. At the heart of this story are the alleged killer and his alleged victim: Edmund Pook, the young Victorian gentleman caught up in a legal nightmare, and Jane Maria Clouson, the young maid whose hard life before her tragic death serves as a bracing corrective to Downton Abbey fantasies about the lives of British servants. Using an abundant collection of primary sources, Paul Thomas Murphy creates a gripping narrative of the police procedural and the ensuing legal drama, with its many twists and turns, from the discovery of the body until the final judgement-and beyond. For while the murder of Jane Clouson has for nearly one hundred and fifty years remained unsolved, much of the evidence remains, and Murphy, applying contemporary forensic methods to this Victorian cold case, reveals definitively the identity of Jane Clouson's murderer-and provides the resolution that Jane's angry supporters long ago demanded.